Are you researching a telephone solution or business phone line or what is the best small business phone system for your company? If so, you might have seen the acronym PBX. PBX stands for Private Branch Exchange and is a term which means a business standard telephone system. A business standard telephone system offers important features that businesses require to run their daily operations. Some of these important features include call conferencing, extension dialing, setting for business hours to route calls outside office hours, music on hold, and customer waiting queues. There's a wide range of different PBX systems and phone service providers. The majority available nowadays are digital and utilize the internet for video and voice communications. Traditional PBX analog phone systems have been in circulation for a long time and are connected to the Public Switch Telephone Network utilizing Plain Old Telephone Service lines. Incoming business calls are routed and transferred via the PBX system which manages the calls via a physical connection to the copper wiring of the phone lines. An analog PBX system connects to Plain Old Telephone Service lines which pre-date the internet. Analog systems do not have the capability to offer many modern features such as high definition voice calls and voicemail-to-email. In enterprises, the most popular PBX systems are Internet Protocol (IP) PBX helped by the steady replacement of copper phone lines with broadband Internet. While it is possible to buy an analog system, it is not advisable as they cannot be upgraded or expanded. To work with a VoIP system or other digital hardware an adapter is necessary. IP PBX systems deliver voice calls via the Internet and are also known as VoIP systems. An On-Premise IP PBX system is housed internally within an office and is a VoIP-based phone system. Rather than a physical connection to a PBX via copper writing, there's a connection to the PBX via an office Local Area Network, typically utilizing the same Internet connection that the office computers utilize. By utilizing the Internet, an IP PBX system is suitable for high definition audio along with some more advanced features, including flexible office hour rules, call queuing, application integration, and interchanging with CRM platforms and other unified communications. There's an additional element to make the phone systems work which is either SIP Trunking service or Primary Rate Interfaces. These services connect a business's On-Premise IP PBX with the Public Switched Telephone Network. Connection to these services allows a business to make calls from and to their place of business to businesses around the world. The cost to operate an On-Premise IP PBX system includes the phone and PBX equipment, SIP Trunking service or Primary Rate Interfaces plus the time of the IT professional to set up and take care of the system. Hosted PBX or "Cloud PBX Phone System"
A Hosted PBX service removes the telephone system from a business's office and places it in the "cloud." 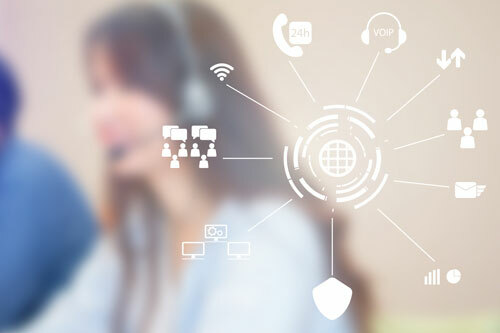 A Hosted PBX service maintained by your telecoms provider allows a business to connect with it via the Internet. The service provider takes care of upgrading the PBX software along with any service downtime and by removing the need to have physical equipment in the office, maintenance costs are eliminated.